Spa-Tech Spa Repair is also known for for our high-quality, custom made spa covers, locally manufactured right here in Orange County. Offered through our sister company, Spa Cover Pros, our spa covers are custom designed to fit in-ground and above ground spas of all shapes and sizes. Our spa covers are made from premium marine-grade vinyl that is specially treated with a UV/anti-mildew protectant, which will help sustain the life of your spa cover. Customers can choose between 16 spa cover colors--ranging from Walnut, Charcoal, Forest Green, and Tropical Blue--to match their home's surroundings and decor. Our personalized spa cover service starts with us coming out to your Orange County residence to take exact measurements and create a comprehensive spa cover footprint. This footprint takes into account your spa's size, shape, and configuration, as well as the style and foam density strength that is most appropriate for your spa. 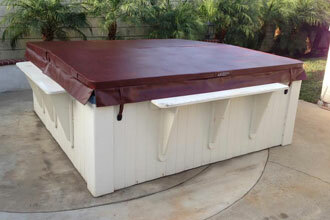 Once the design is approved, your spa cover is carefully crafted by our Orange County specialists. We will then expertly install your new spa cover, ensuring that it is perfectly fitted to retain heat and protect against leakage and contamination. In addition to spa covers, we also sell and install customized spa cover lifts, which allow you to easily move and store your spa cover. Call us today to learn more about our custom made spa covers. We service the entire Orange County, California area, and look forward to working with you. Have an older spa that needed a part and Jim was the only one who had one. Service was quick and I will definitely be using Jim for future repairs.